EPS control unit STC-6, "EPS Control Unit"
EPS motor STC-6, "EPS Motor, Torque Sensor, Reduction Gear"
Torque sensor STC-6, "EPS Motor, Torque Sensor, Reduction Gear"
Reduction gear STC-6, "EPS Motor, Torque Sensor, Reduction Gear"
EPS warning lamp STC-9, "WARNING/INDICATOR/CHIME LIST : Warning Lamp/ Indicator Lamp"
ECM Transmits mainly the following signals to EPS control unit via CAN communication. ABS actuator and electric unit (control unit) Transmits mainly the following signal to EPS control unit via CAN communication. Combination meter Transmits mainly the following signal to EPS control unit via CAN communication. Turns ON the EPS warning lamp according to the signal from EPS control unit via CAN communication. 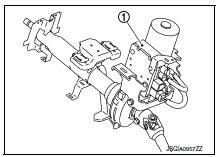 EPS control unit (1) is installed to steering column assembly. 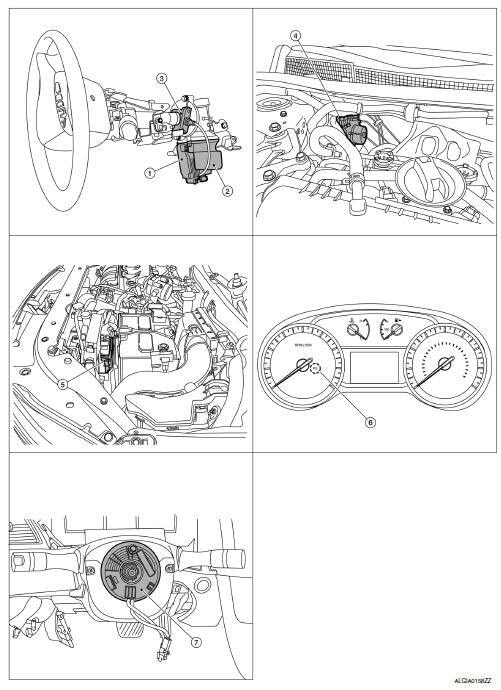 EPS control unit performs an arithmetical operation on data, such as steering wheel turning force (sensor signal) from the torque sensor, vehicle speed signal, etc. Then it generates an optimum assist torque signal to the EPS motor according to the driving condition. 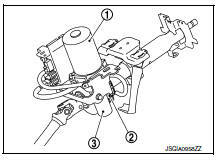 EPS motor (1), torque sensor (2) and reduction gear (3) are installed to steering column assembly. EPS motor provides the assist torque by the control signal from EPS control unit. Torque sensor detects the steering torque, and transmits the signal to EPS control unit. Reduction gear increases the assist torque provided from EPS motor with worm gears, and outputs to the column shaft.